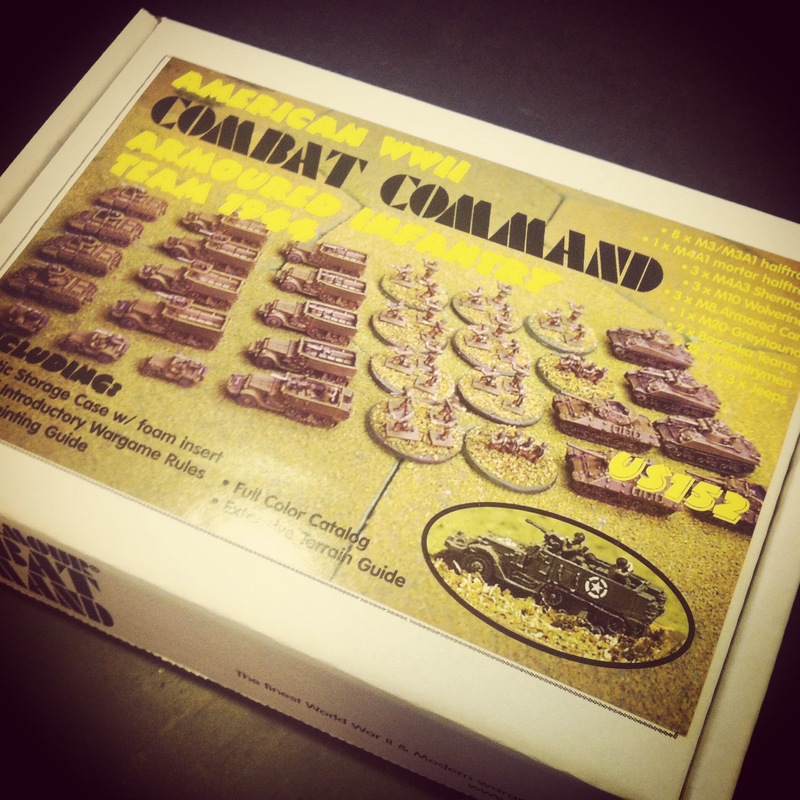 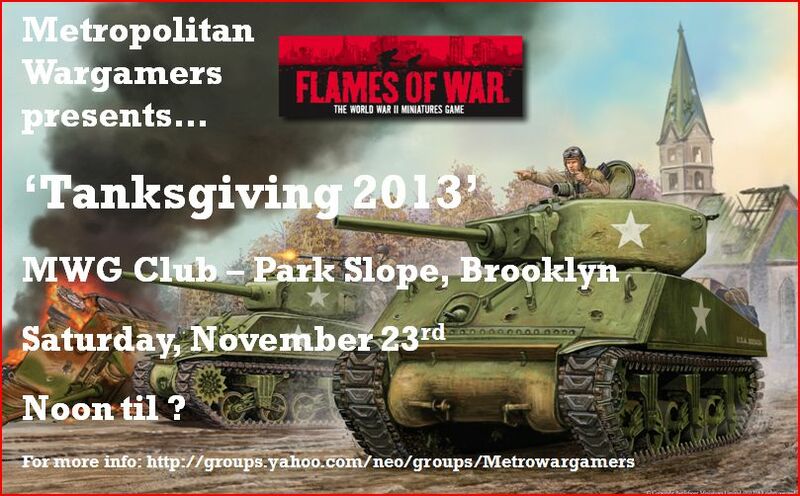 About ten of us at Metropolitan Wargamers in beautiful Park Slope, Brooklyn kicked off the holiday season this past weekend with a day of WWII armored action in conjunction with our first Flames of War Tanksgiving event. 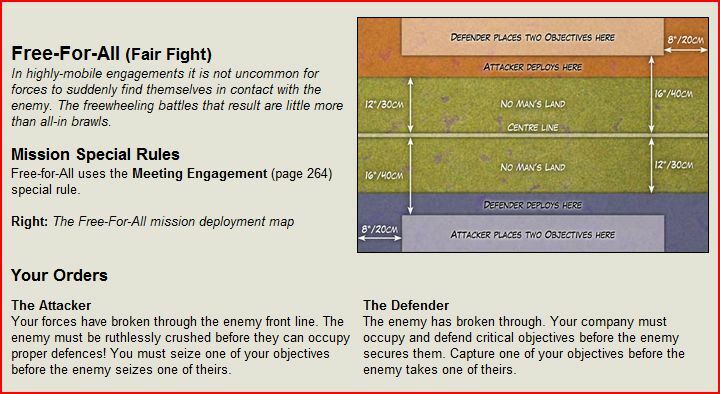 The official rules for the event called for 1500-point companies facing off in multiple games throughout the day. 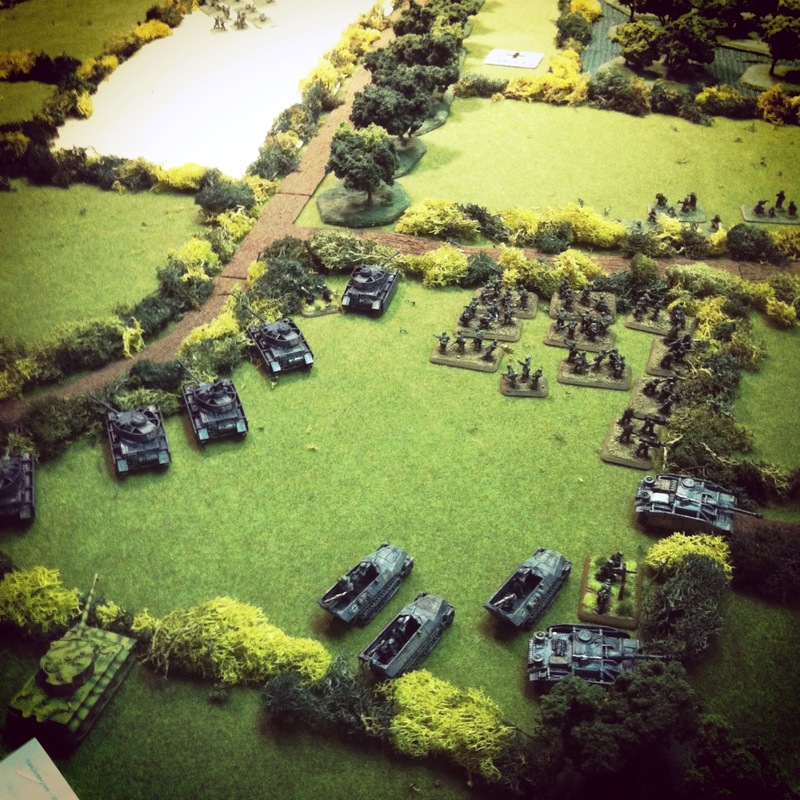 Given we had so many new players interested in playing their first games of Flames of War, a few of the more experienced players decided to play host with our own forces brought along for the day over two tables. 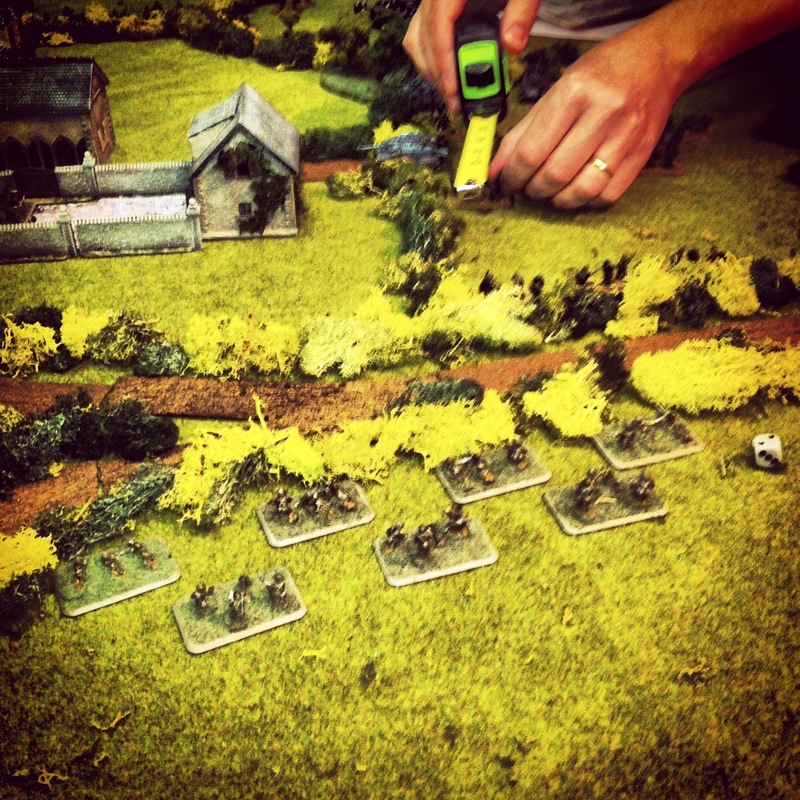 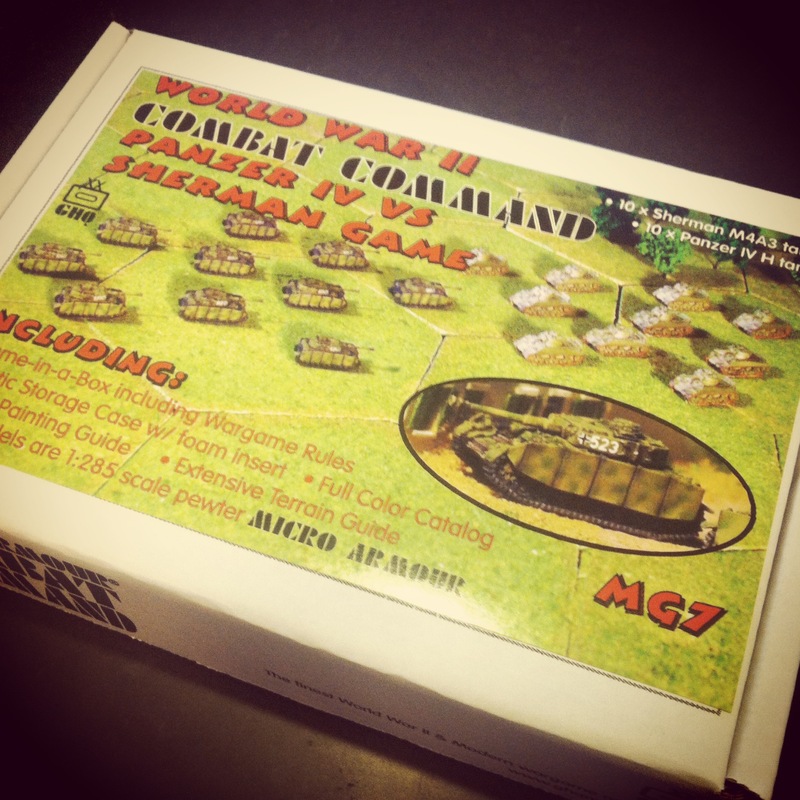 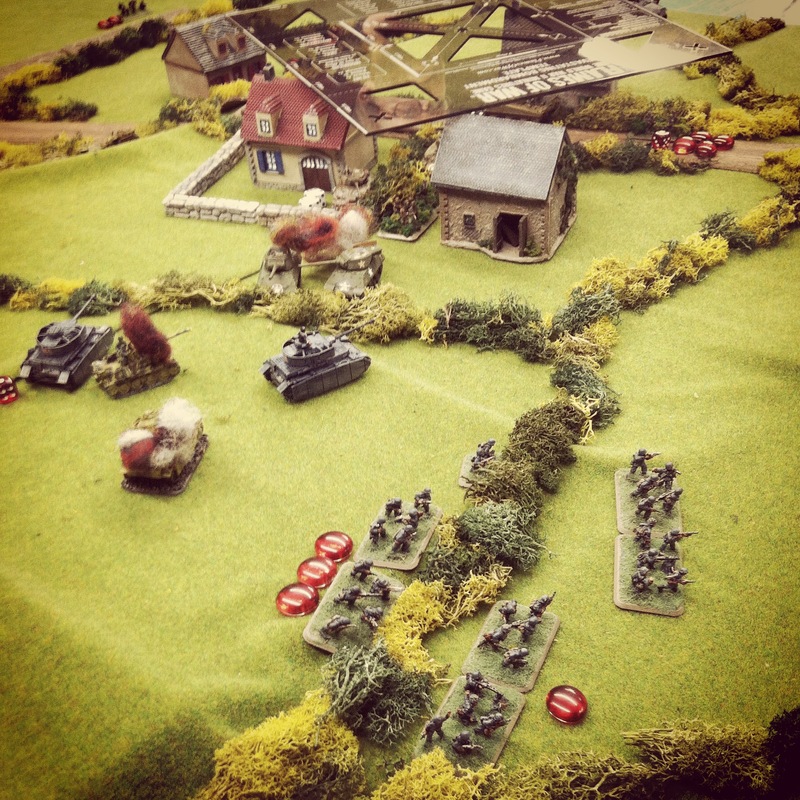 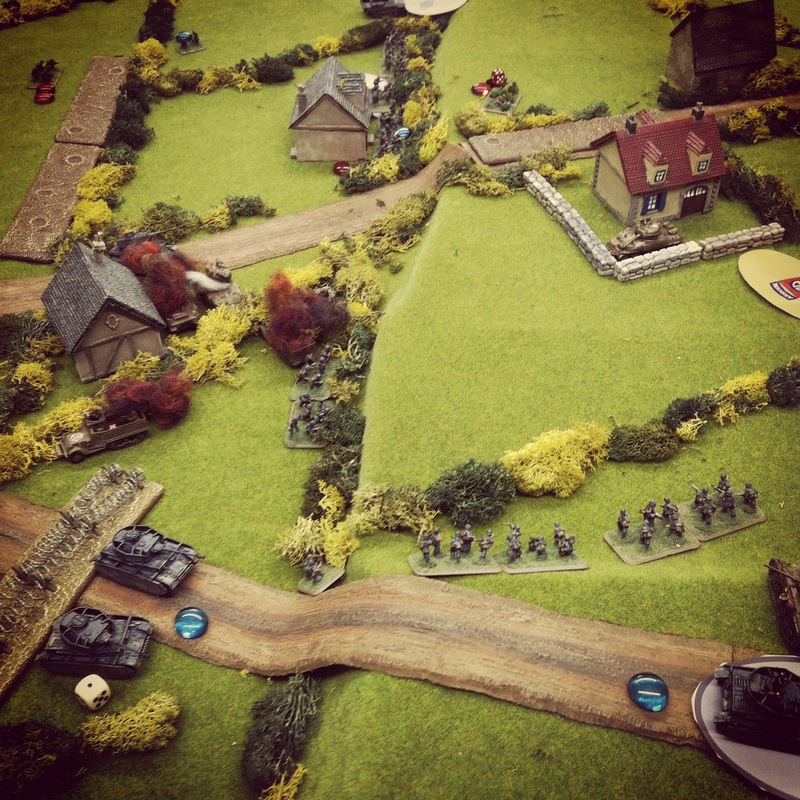 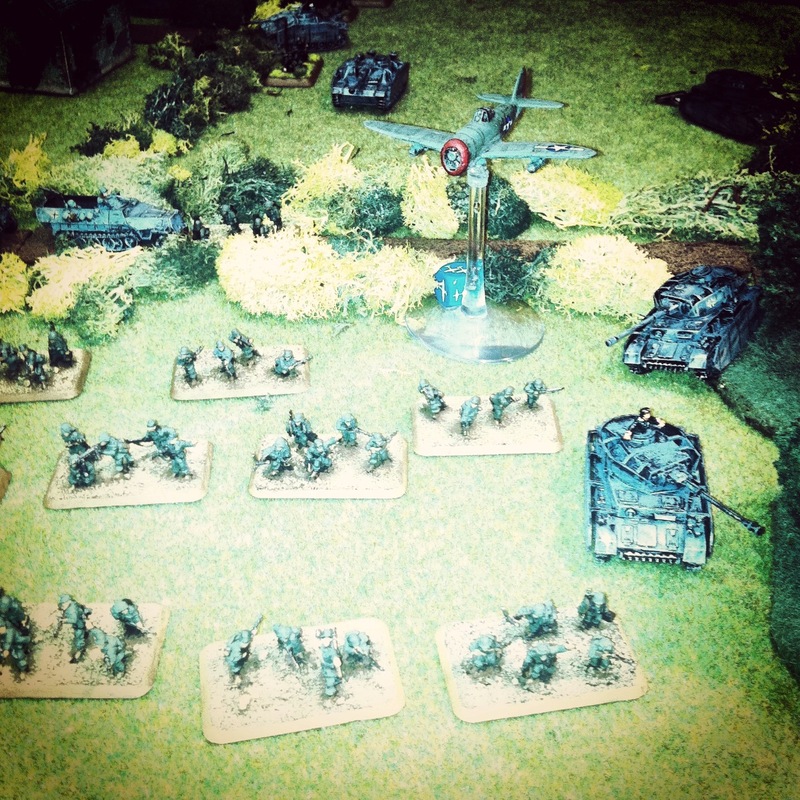 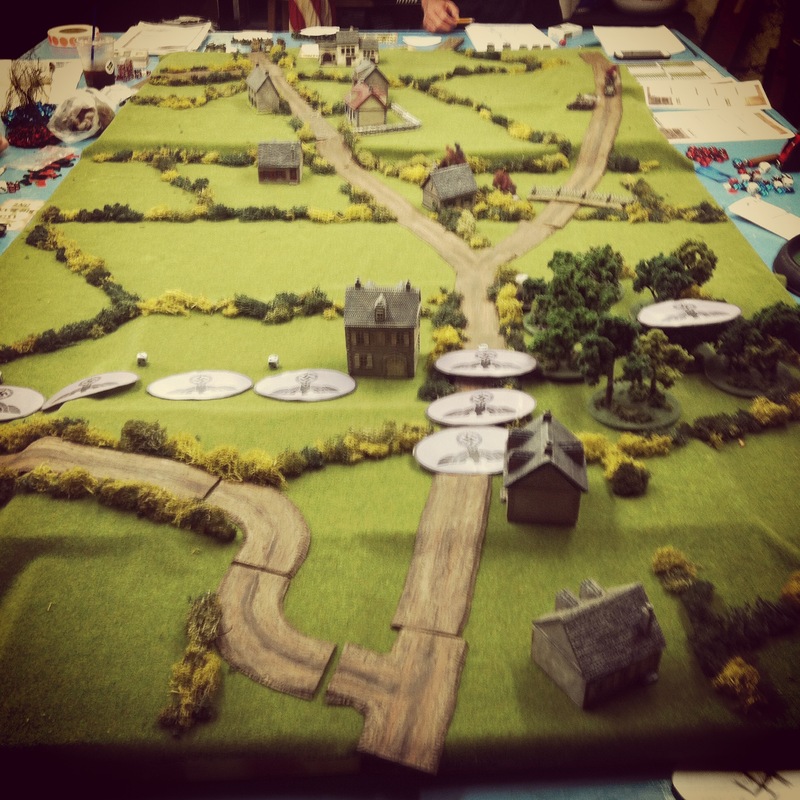 The bigger of the two tables featured Allied forces facing off against Germans in a Late War Western Europe scenario. 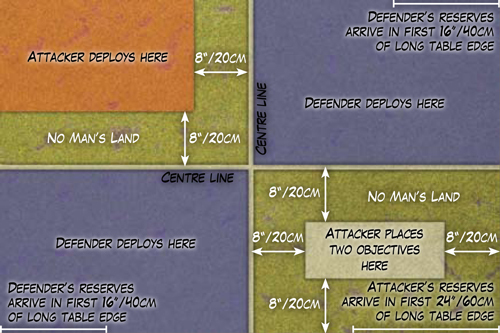 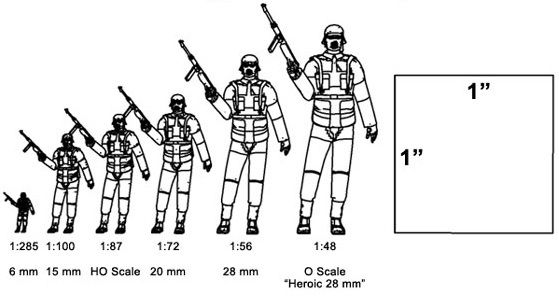 The Flames of War website offers a group of basic missions of increasingly-complex scenarios, each easily playable in about three hours. 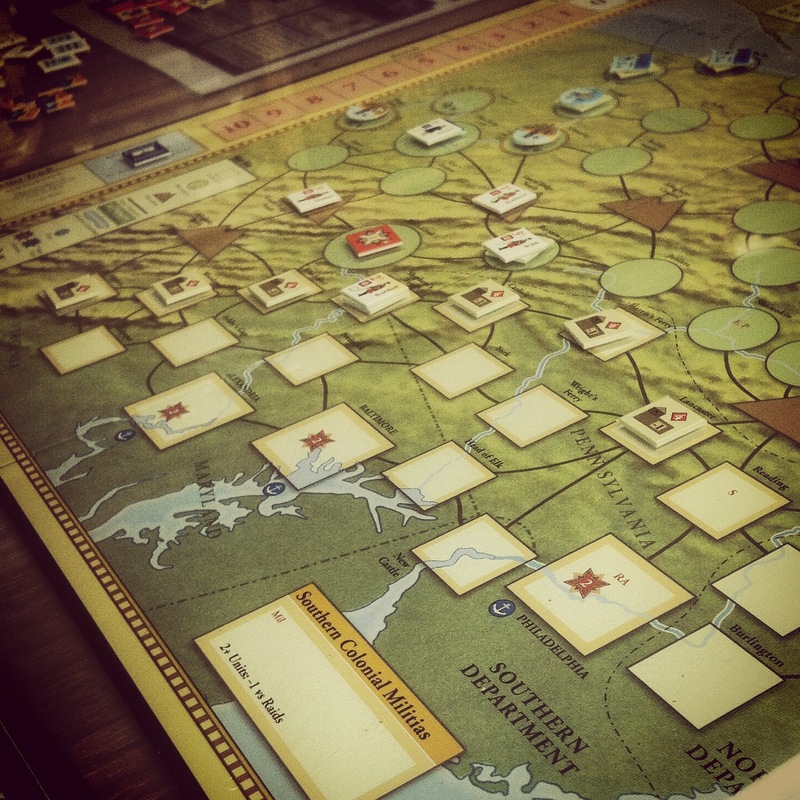 Given we were dealing with an entry-level game, we went with a beginner-friendly Free-For-All mission with two 1500-point companies on each side. 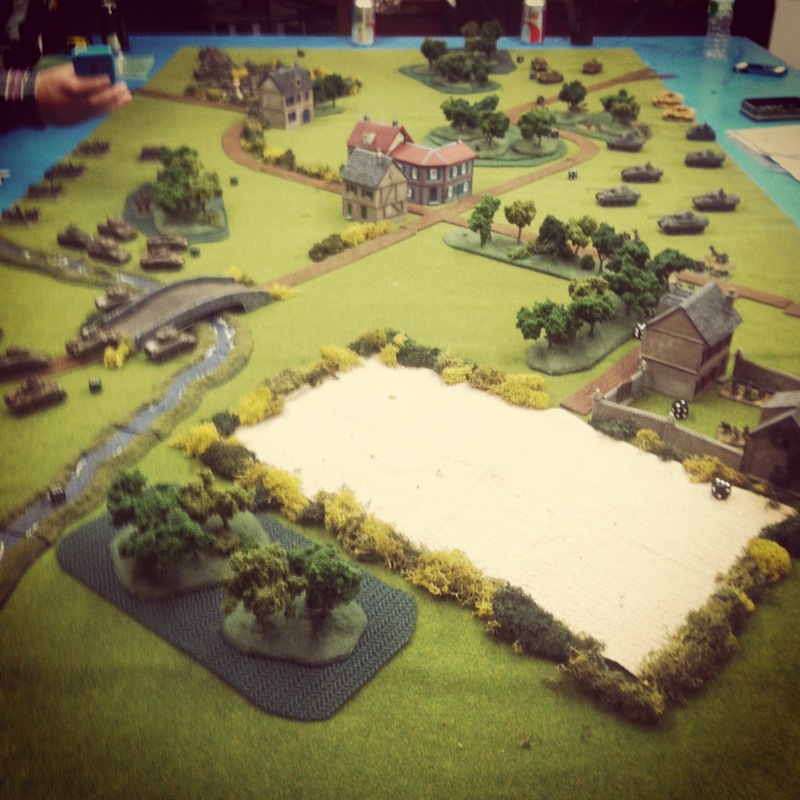 Since this was a tank-focused game, we went easy on terrain with just a smattering of wooded areas, buildings and fields spread over the table. 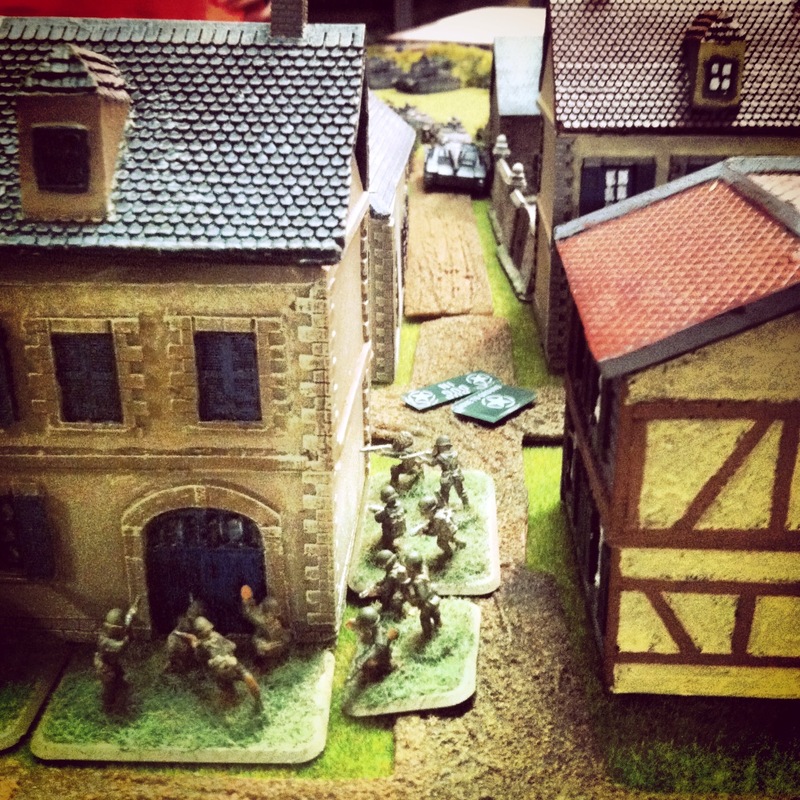 The Allied forces defended, beginning on the side of the table defined primarily by a small river crossing bridge on the Allied right and a field and nearby farmhouse on the Allied left. 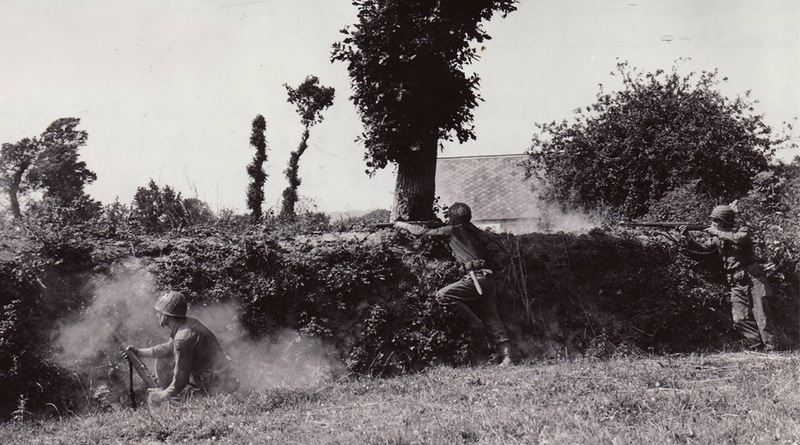 On the attacking German side of the table, a walled farm complex surrounded by a tree-lined road sat to the German left and a group of wooded areas to their right. 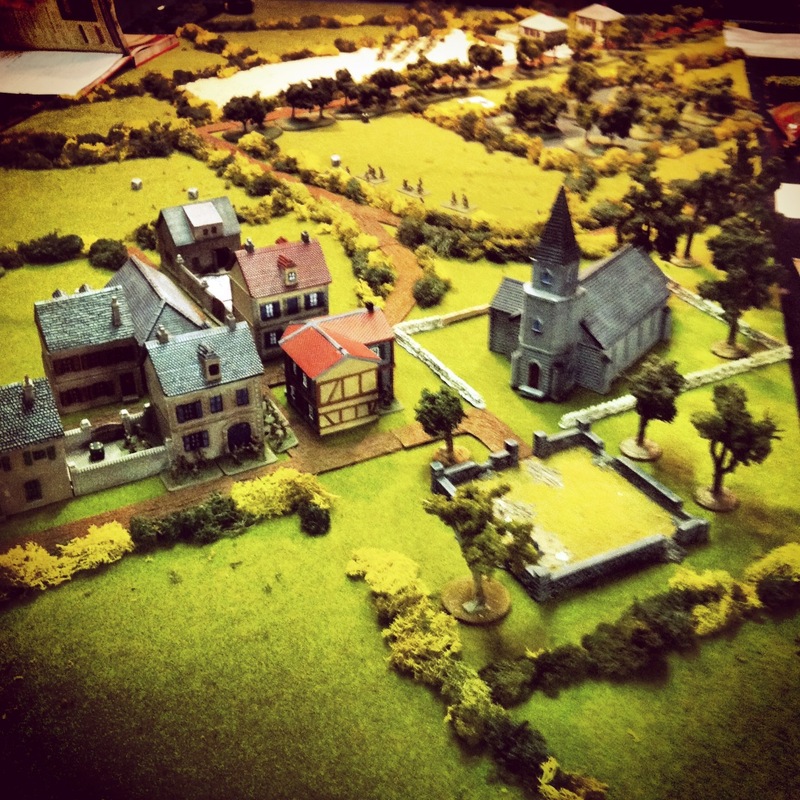 A small town was situated squarely at a crossroad at the center of the field. 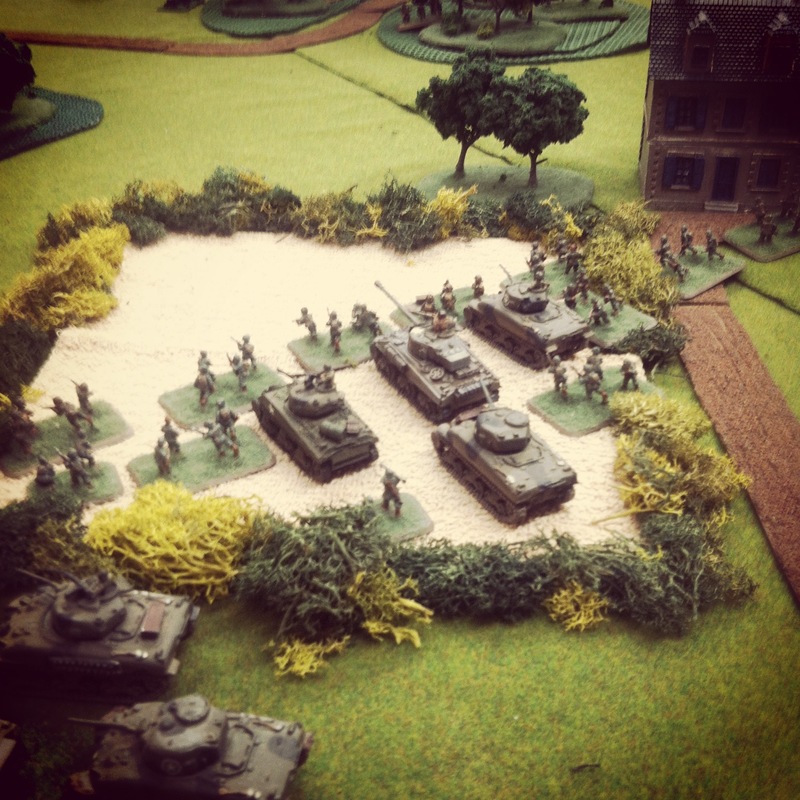 The British Guards Armoured Company began near the farm at their left, deploying its Sherman and Firefly tanks along with one platoon from the US 101st Airborne. 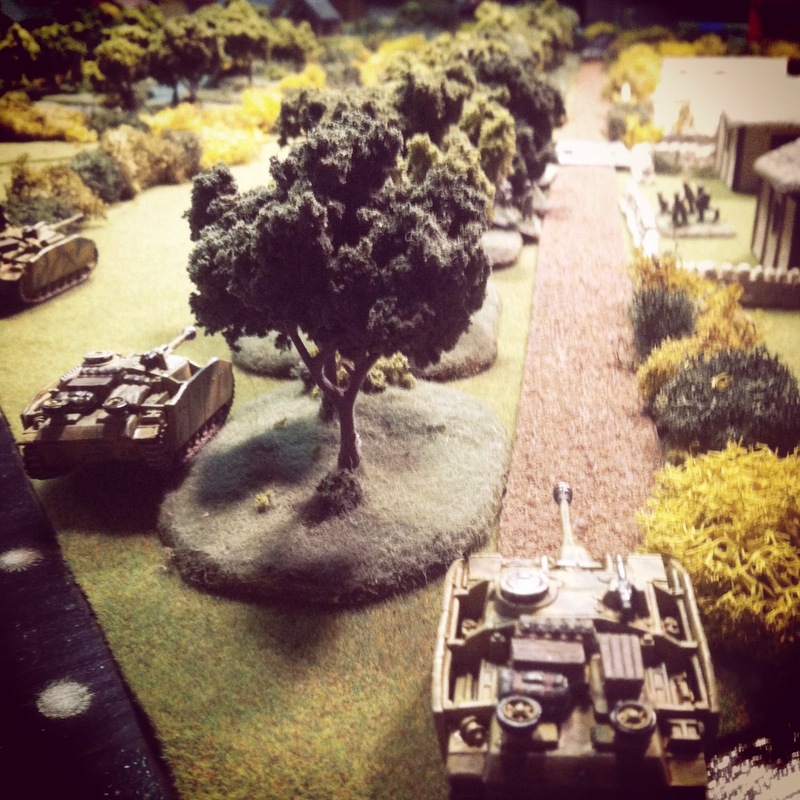 Near the bridge, the US 4th Armored Company set its 75mm and 76mm tanks and finally deployed its 105mm artillery platoon at the center of the table edge hidden behind a copse of trees. 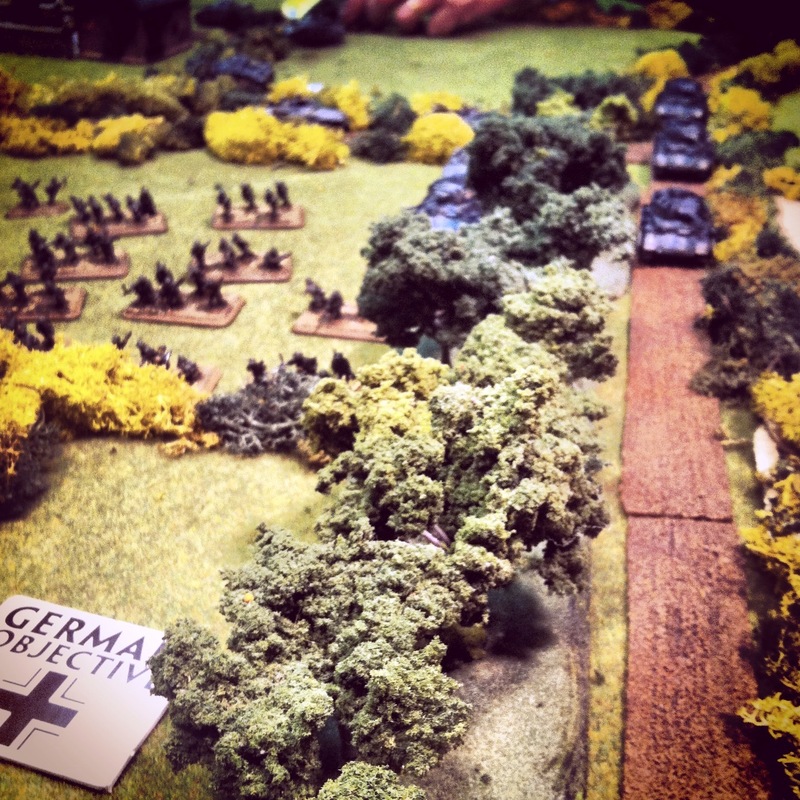 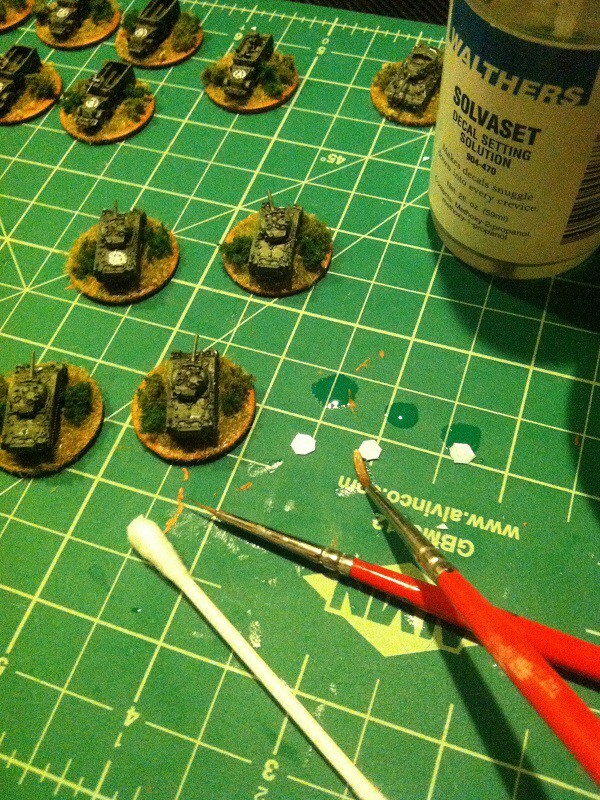 The Germans deployed Panzer IVs, two Tiger tanks and a Grenadier platoon near a forest at their right. 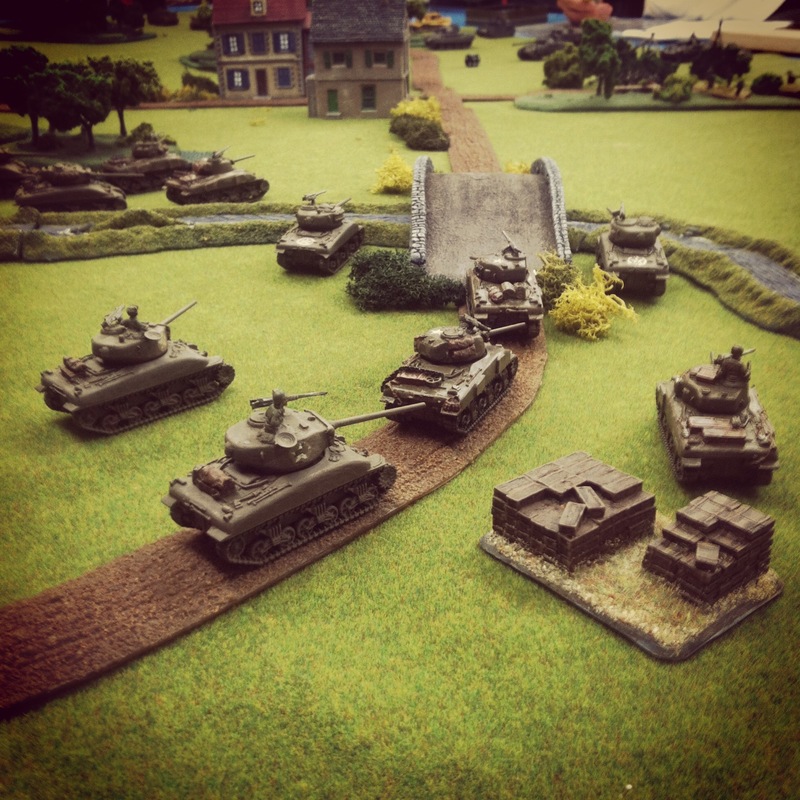 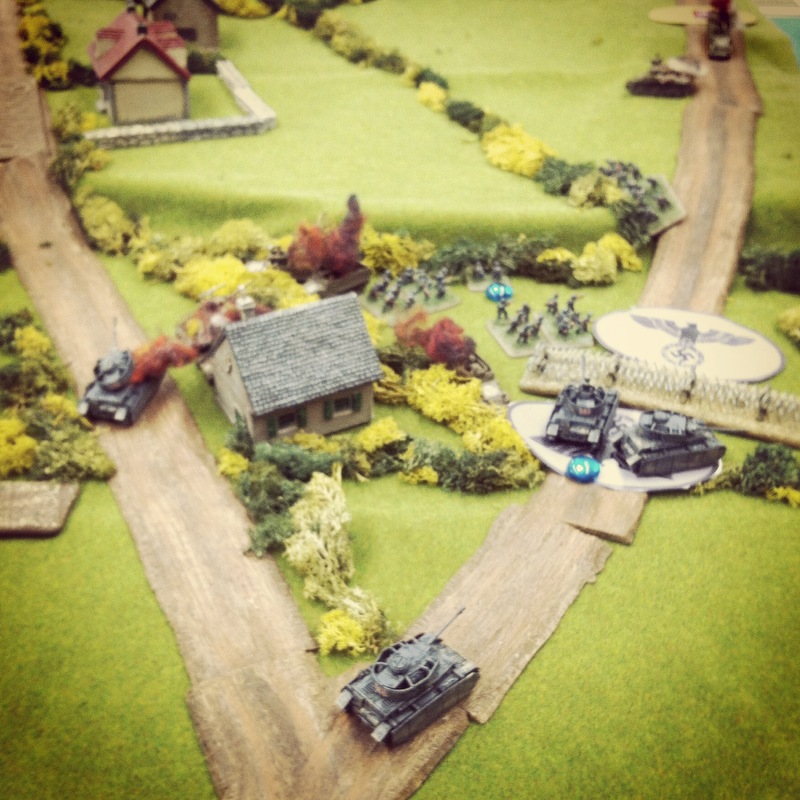 A large group of Panthers started near the center behind the small town with a supporting dismounted Panzergrenadier platoon on their left and a two-tank Panther command platoon at their extreme left. 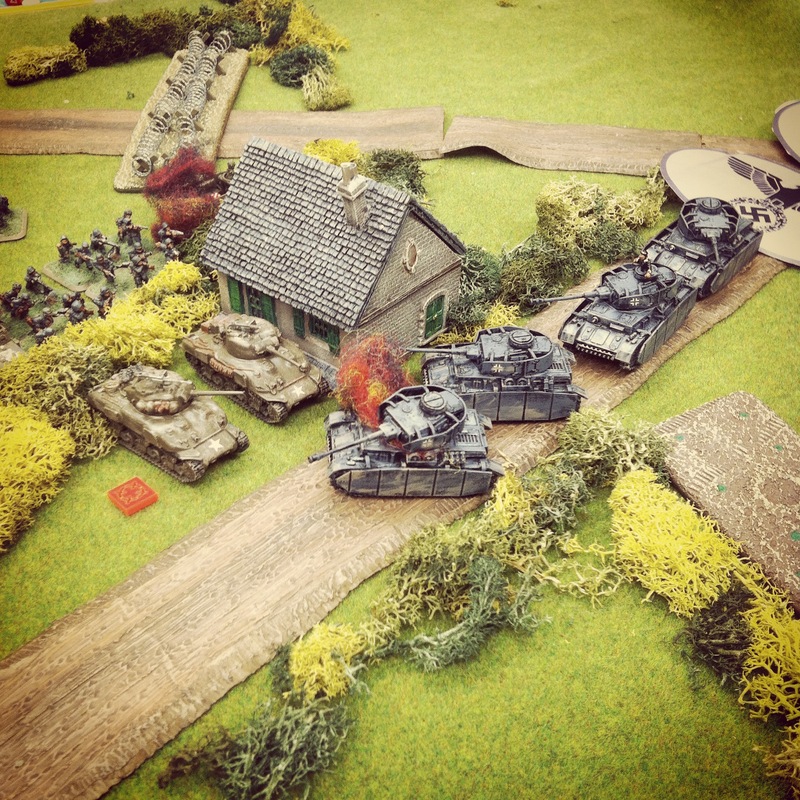 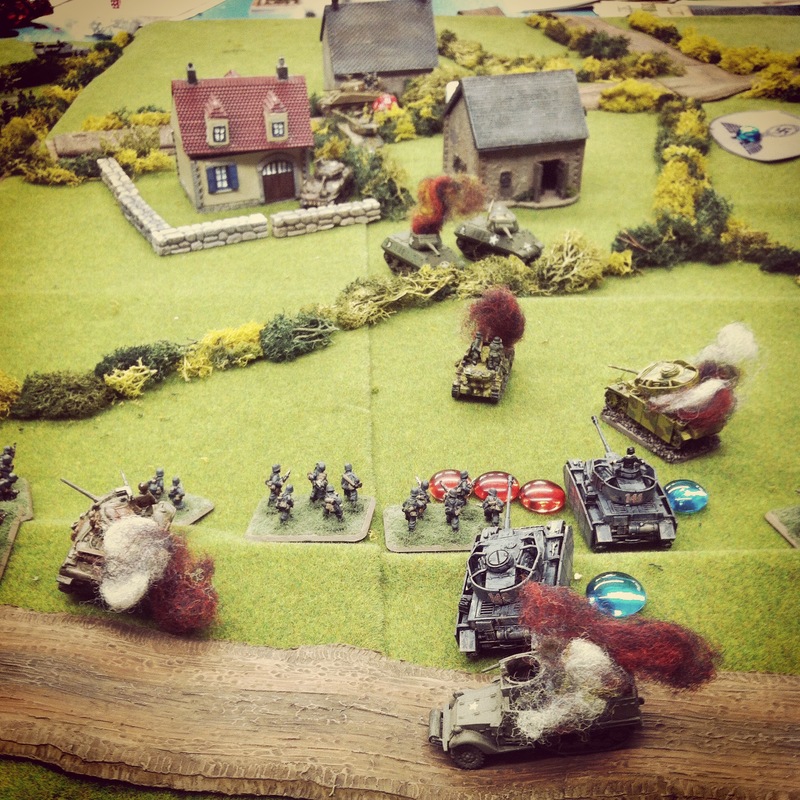 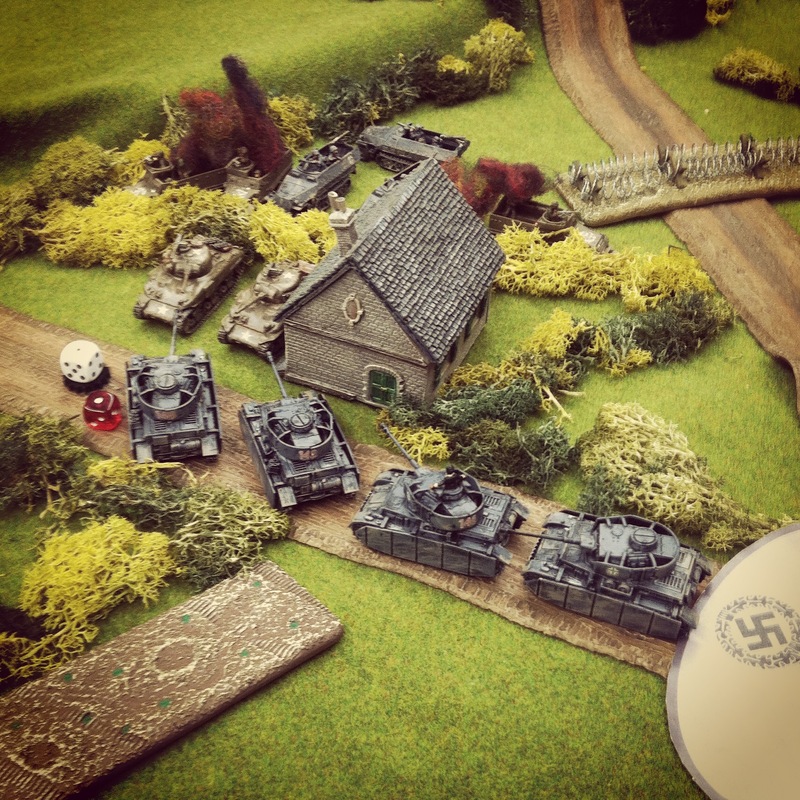 With the German player starting things off, their main thrust of Panthers moved toward the center of the table while their Panzer IVs and Tigers made a move looking to shutdown to the advance of the Guards Armoured and US airborne troops. 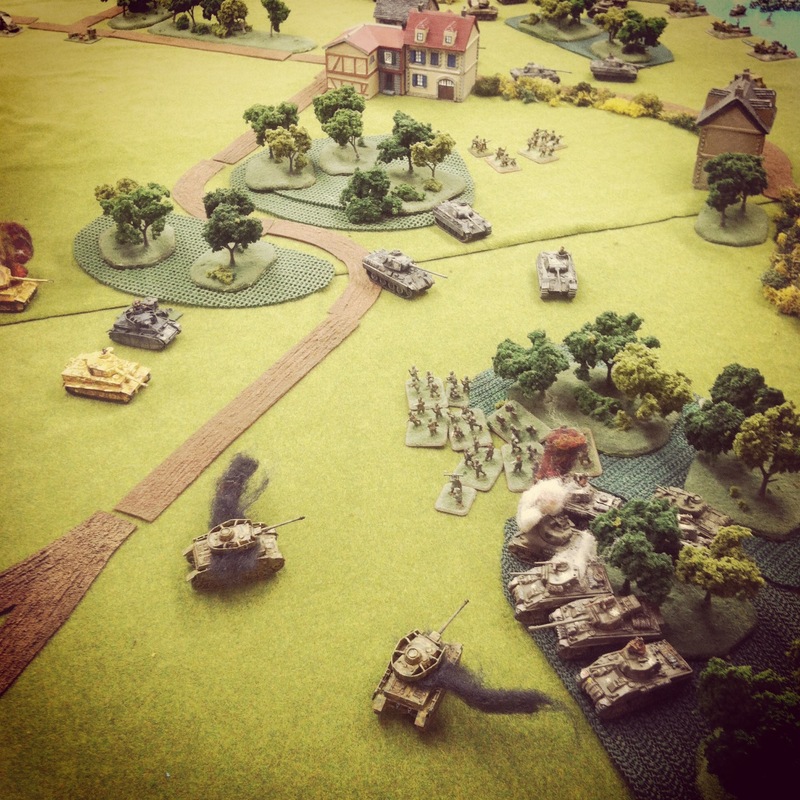 The Panzergrenadiers made their way for the walled farm and the treeline at the neighboring road, and the commanding Panthers looped around the farm toward the river and the American right flank. 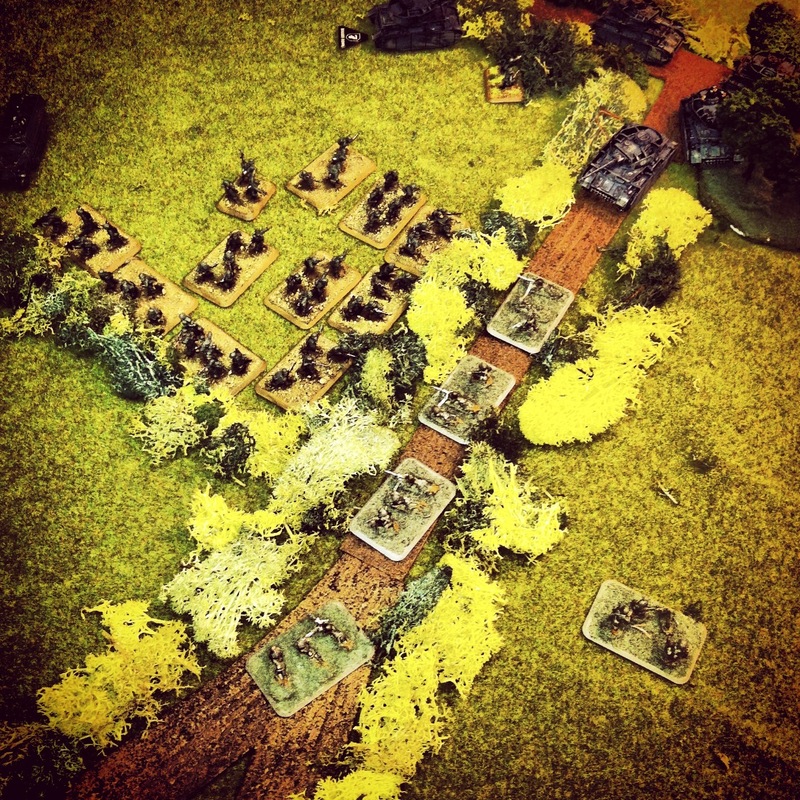 On the Allied first turn, the 101st Airborne made a beeline for the neighboring forest across from the field while tanks rolled into the gap between the forest and the field. 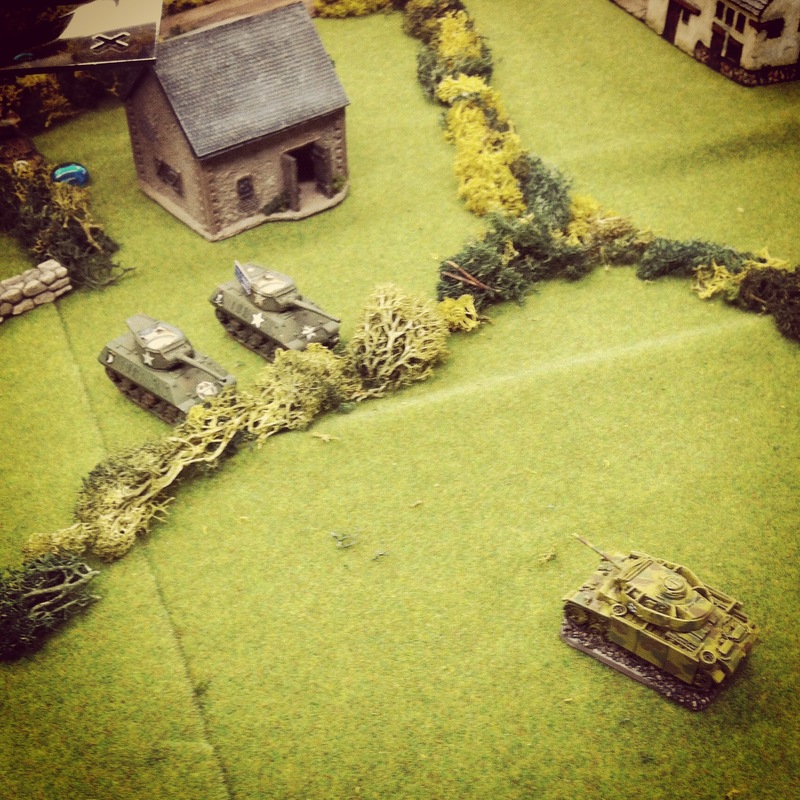 A lucky opening shot from a British Firefly took out a German Tiger, providing one of the only bright spots for the Allies during the entire afternoon. 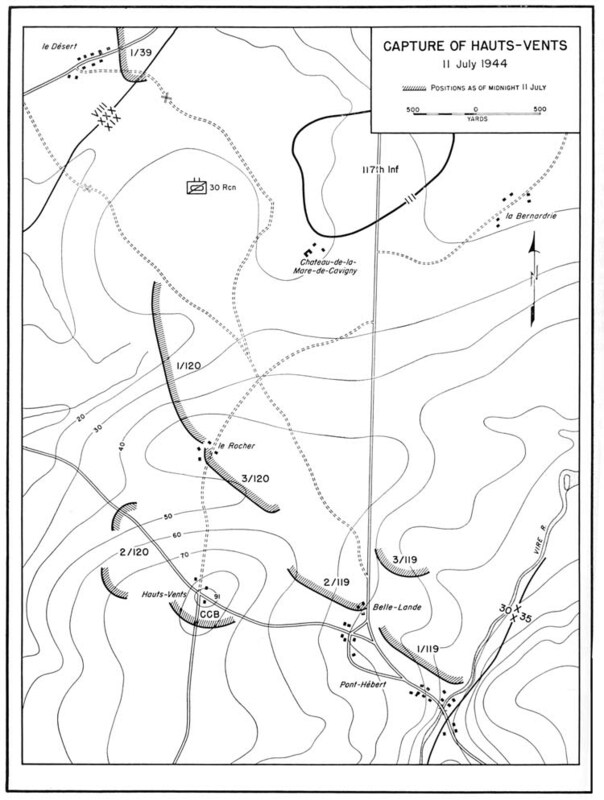 The spotter for the US howitzers ran for the cover of the town’s buildings while the mass of American tanks on the right split to hold off the center German advance as well as the German command section’s coming end-run at the river. 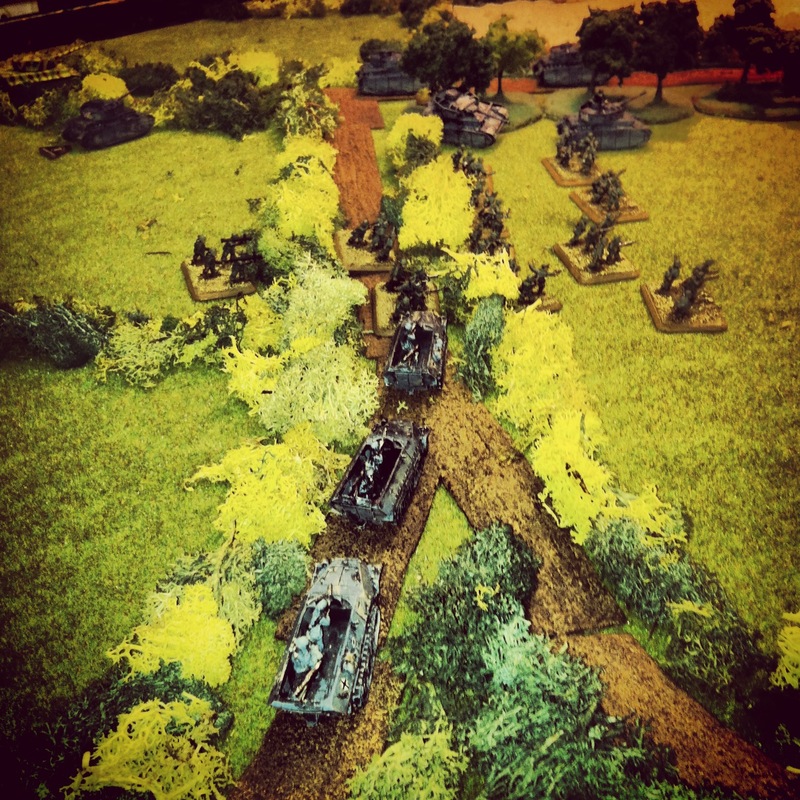 In the second and third turns, the German players began running the table to their victory. 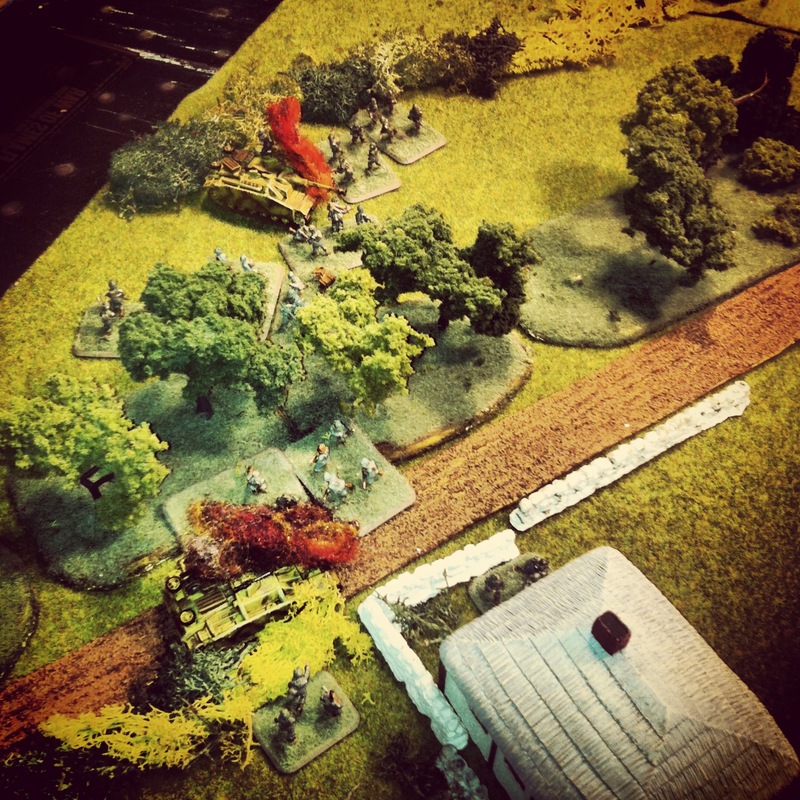 A concentration of fire into the town destroyed the US artillery spotter, effectively shutting down any good chance of Allied artillery support. 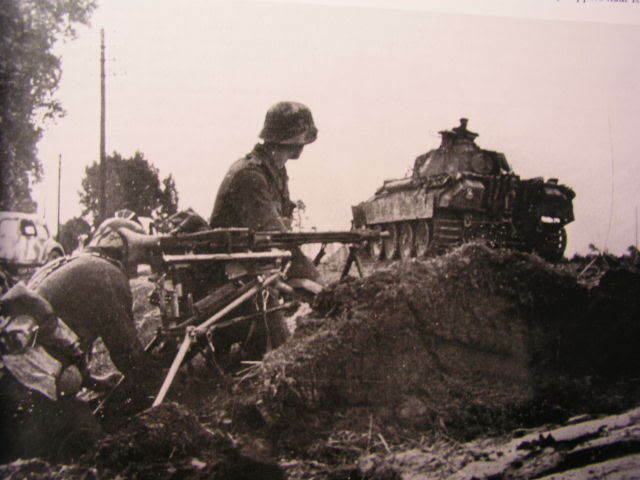 The Tigers began laying waste to the line of advancing Shermans in the field and rolling in the open. 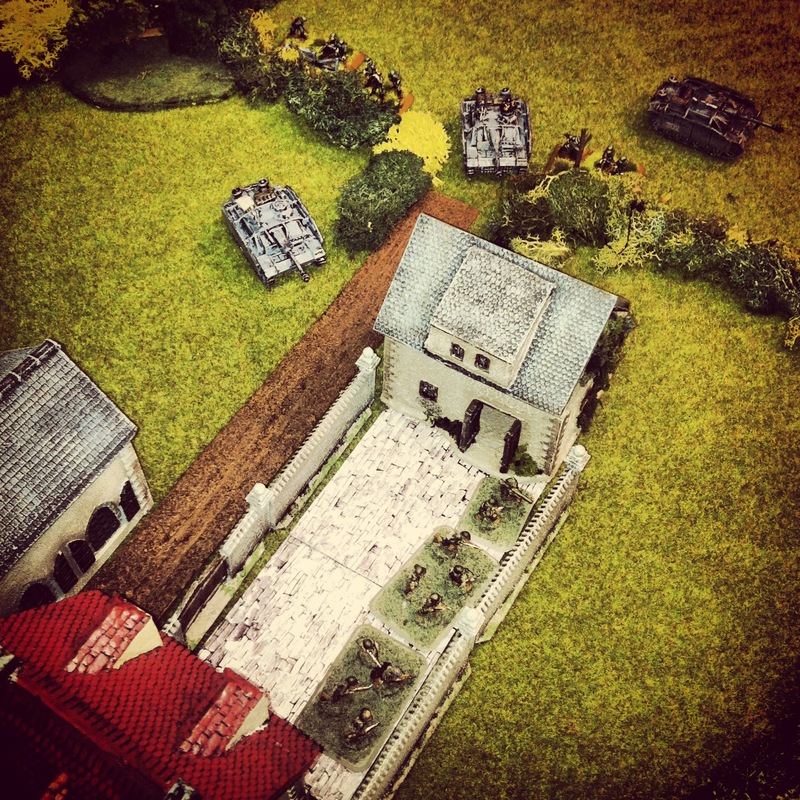 A failed assault on the German tanks by the 101st Airborne out of the woods stalled under a hail of machine gun before it began, but the Guards Armoured managed to route the Panzer IVs off the board and whittle-down the Grenadiers making their way between the town and farm house nearby. 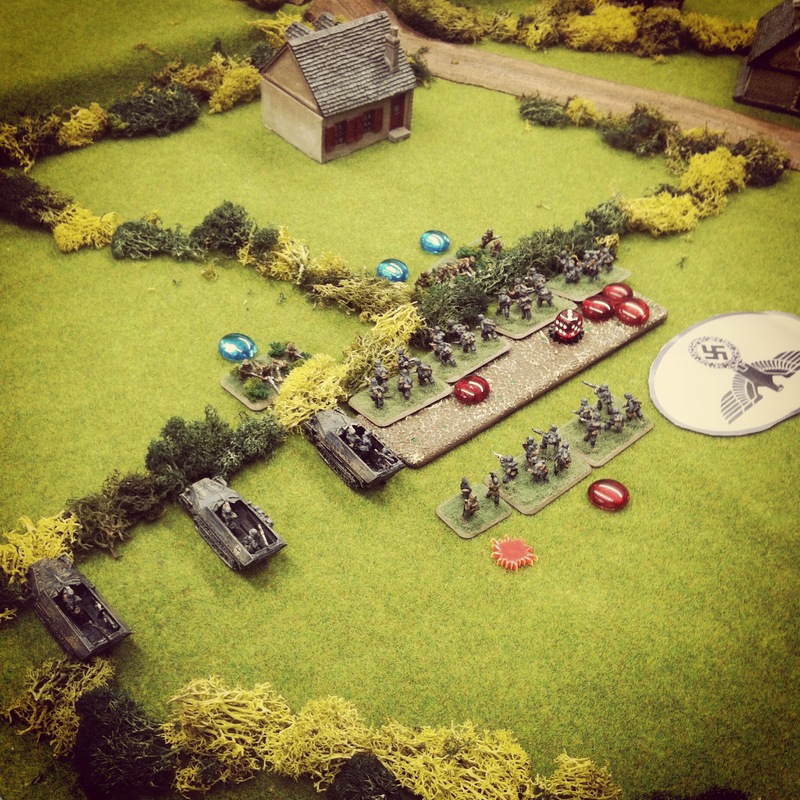 By the fourth turn, German infantry making their way through the open both for the bridge and objective near the American artillery were mowed down under heavy machine gun fire from the US Shermans. 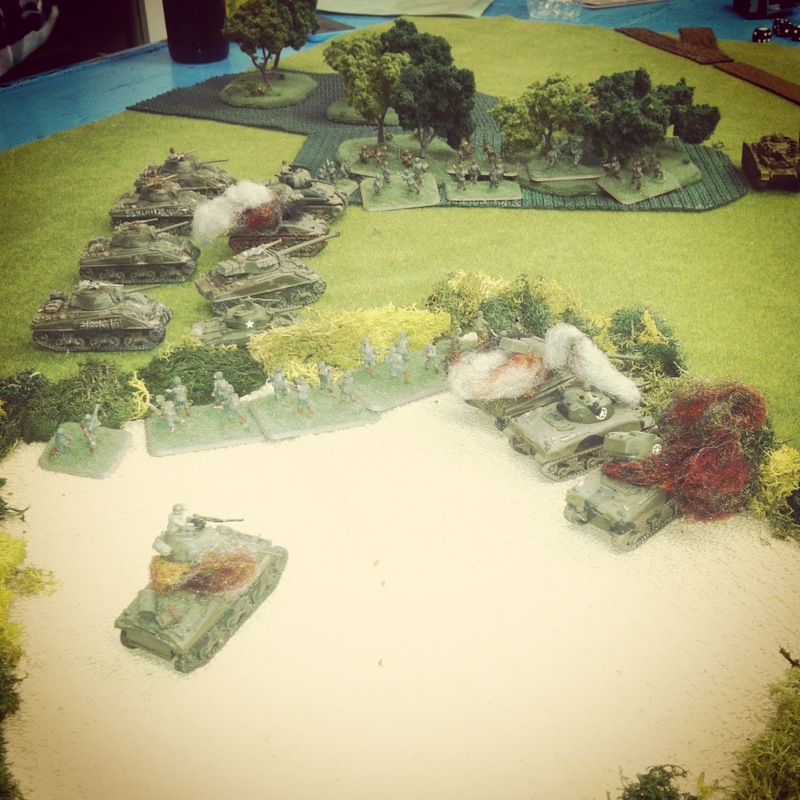 Finding a gap amid the tank fight around them, the 101st made a dash to the next forested area while German tanks poured more fire into the British armor at the rear. 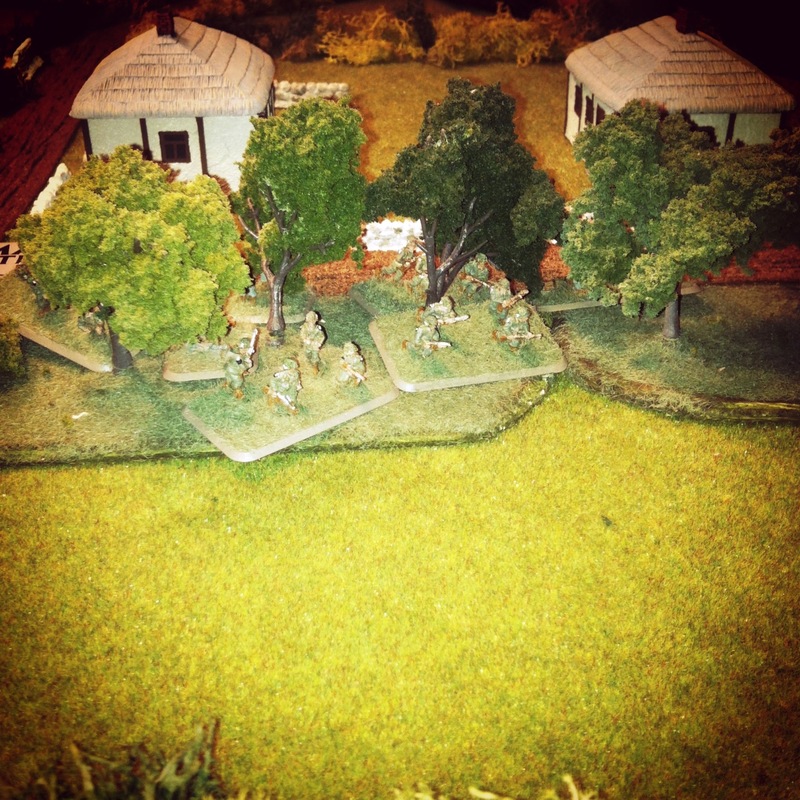 At the bridge, American 76mm guns managed to destroy one command tank and bail the crew from the other. 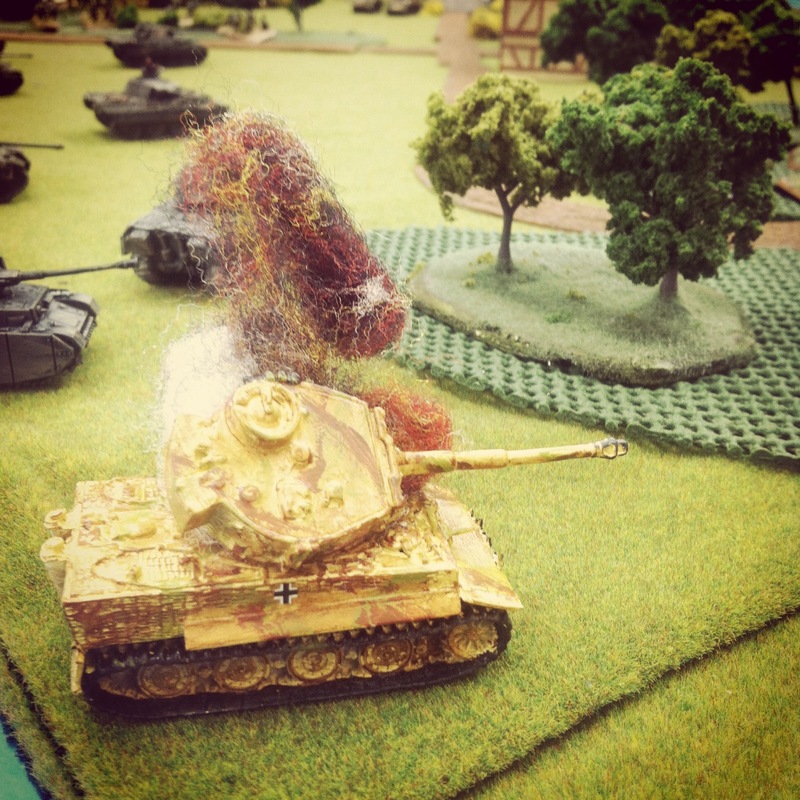 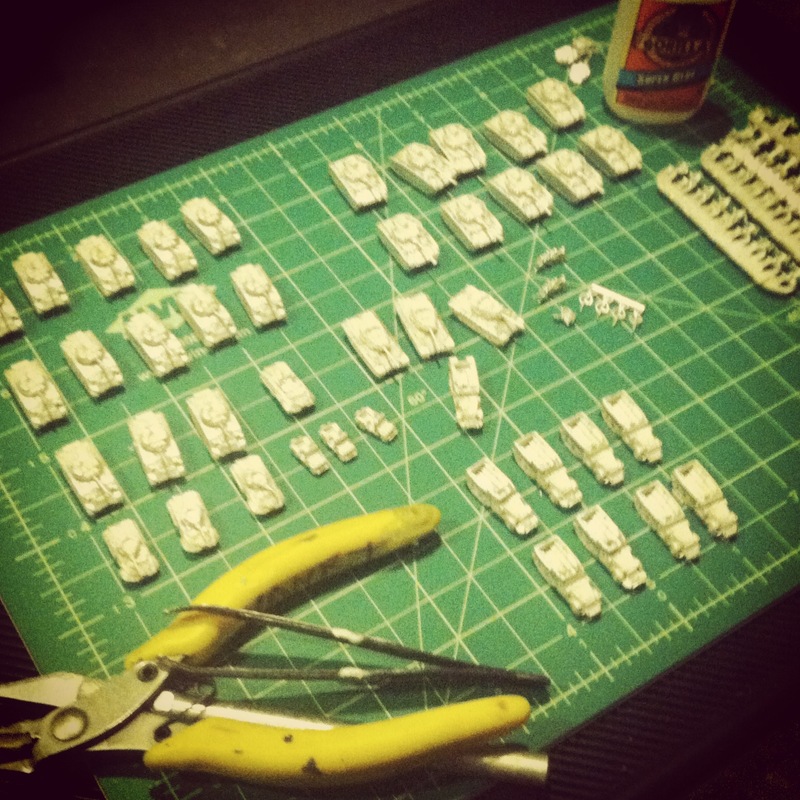 Unfortunately, the remnants of the American armor were outgunned and entangled in the burning shells of their comrade’s tanks. 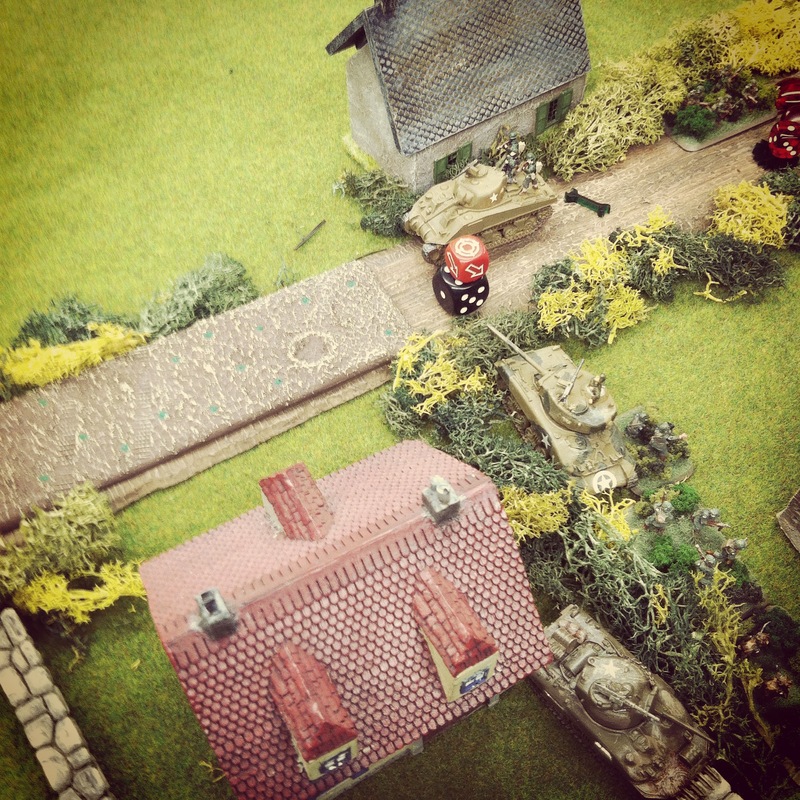 With nothing left to stop the advance, German tanks rolled to the center and seized their objective. 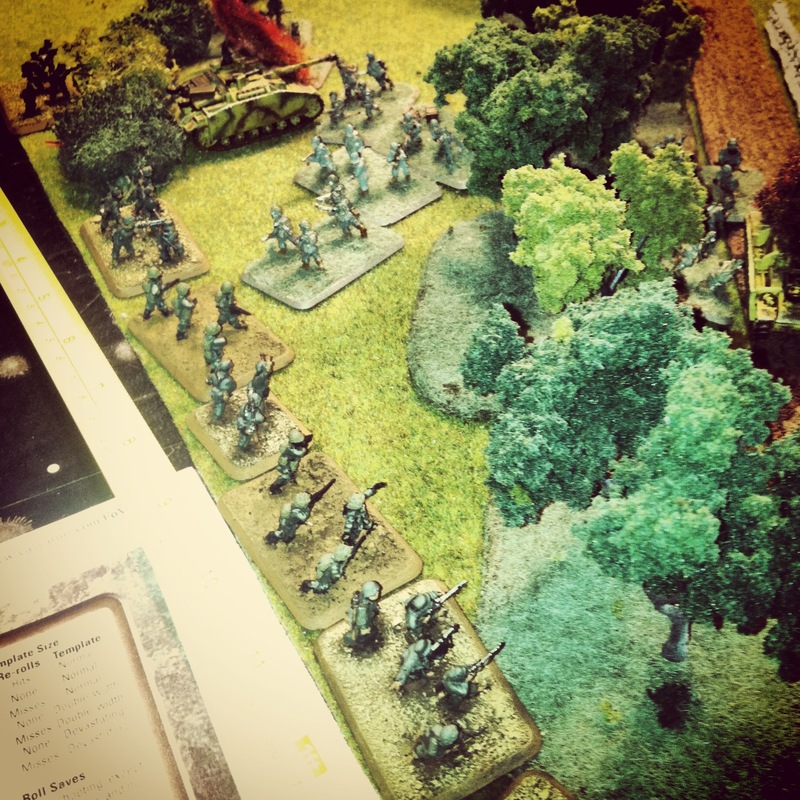 While things raged away on the European table, an Early War showdown between 1500-point British and Italian forces in Africa dustily clamored away one table over. 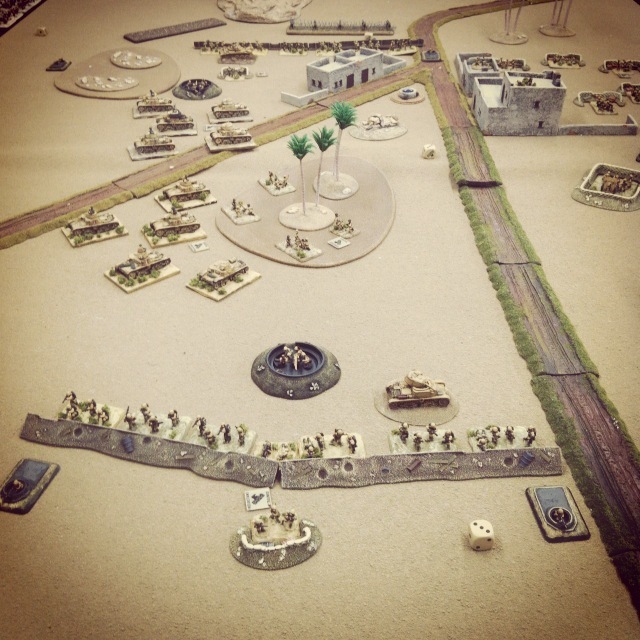 You couldn’t get a more different game with less advanced equipment and differently skilled troops battling in a desert environment laced with prepared defensive positions. 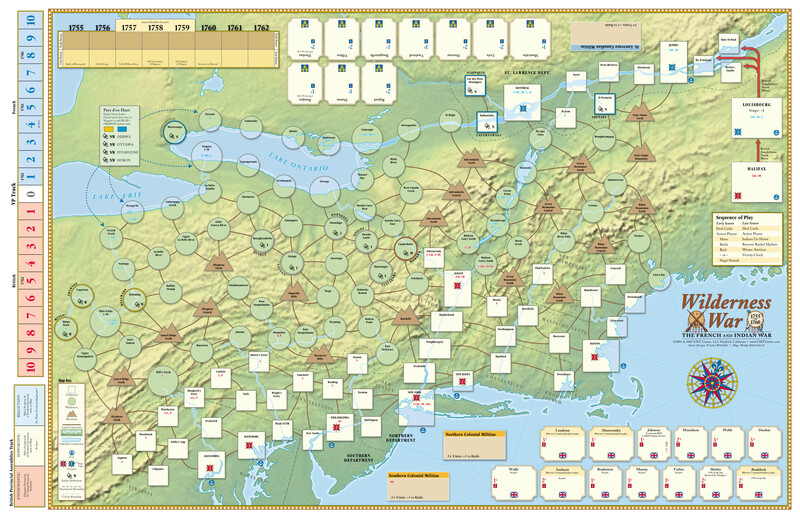 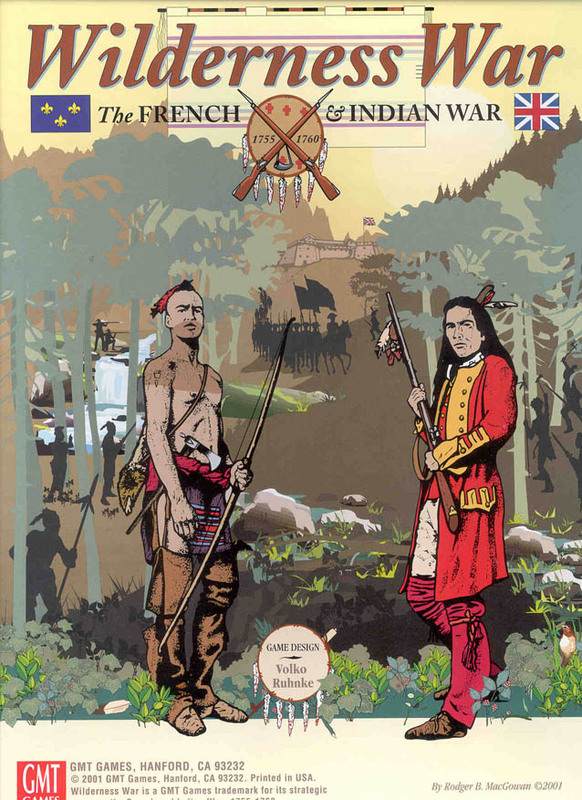 Since most of my gaming has focused on Late War Europe, the earlier war stuff fascinates me and I’m definitely going to make some time to try my hand at this other period soon. 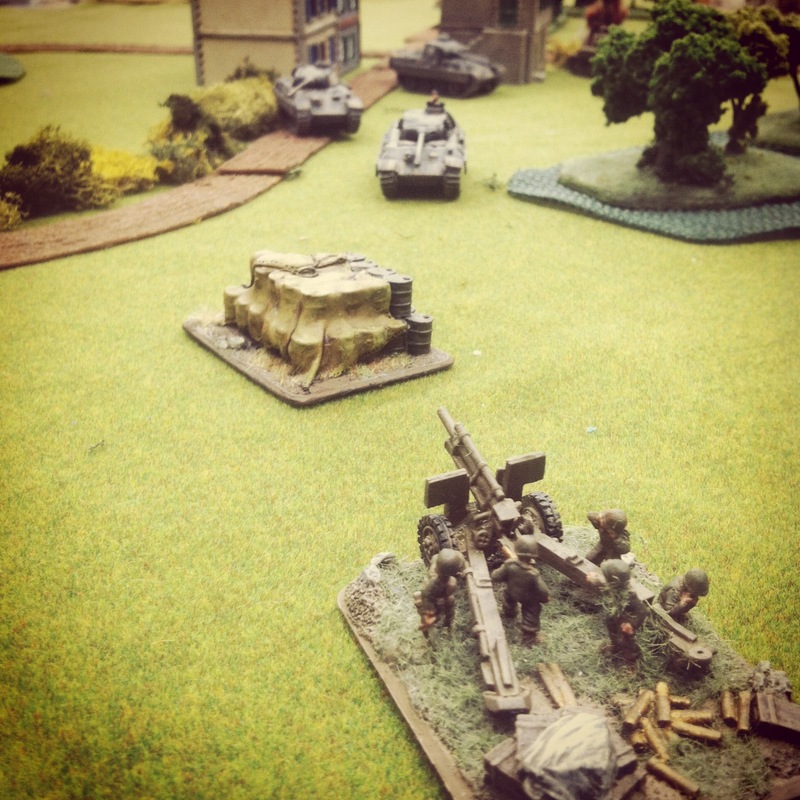 As it turned out, the Italians took the game on the Africa table, making our first Tanksgiving event a 2-0 victory for the Axis powers. 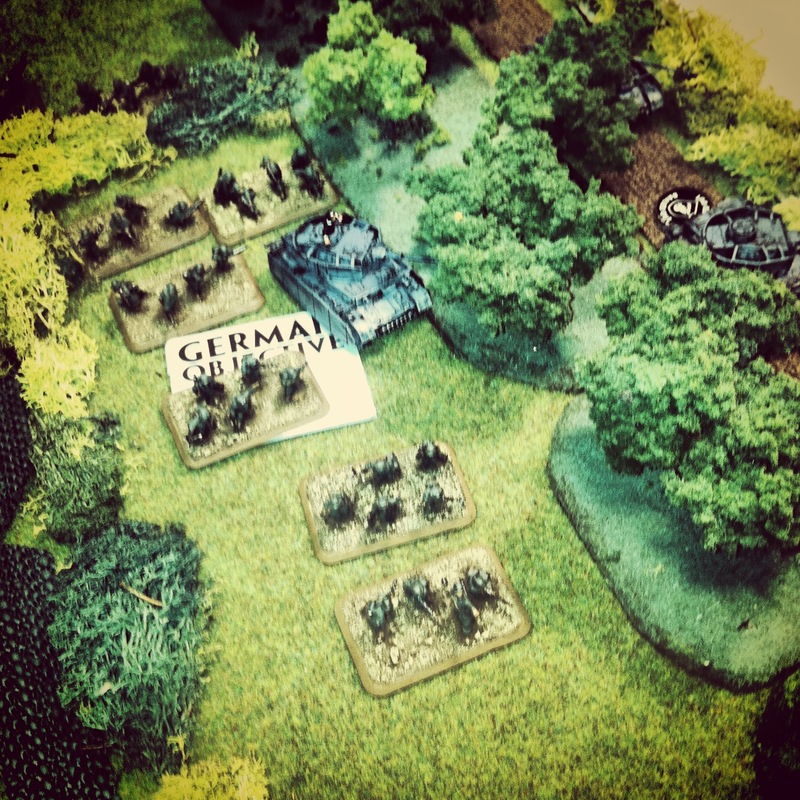 I learned a mass of German armor is really hard nut to crack unless you’ve got some effective artillery and enough infantry to assault and push to an objective. 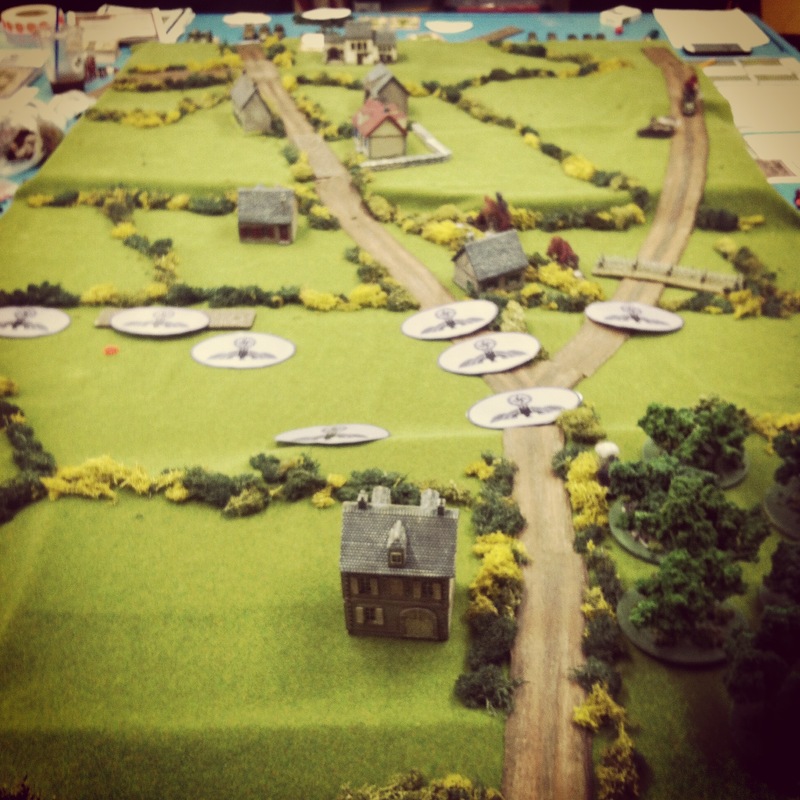 Every game under my belt gives me ideas for the next. 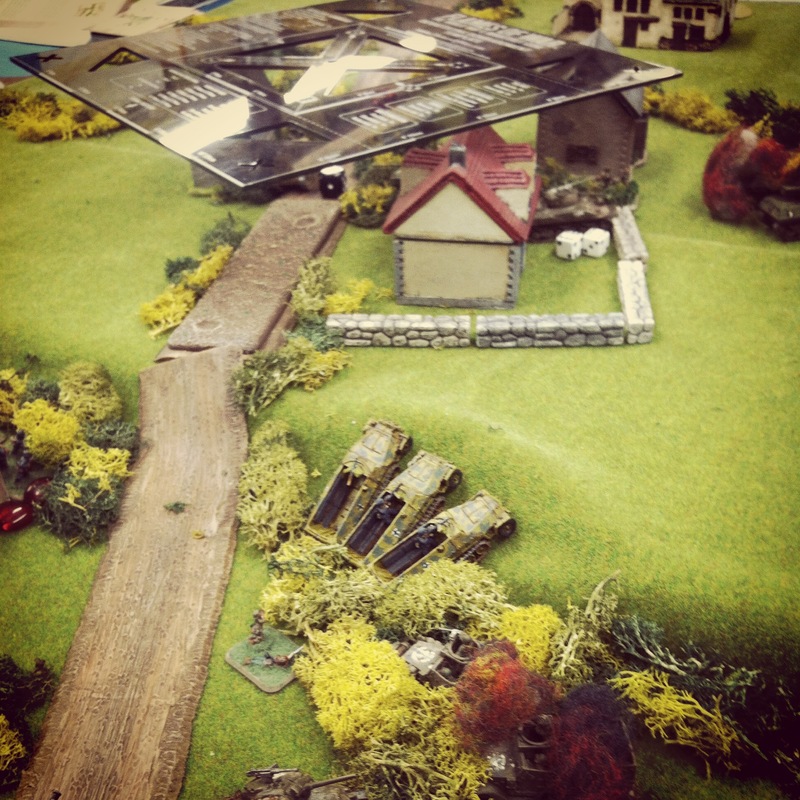 Win or lose, I think a few hours of playing may have hooked a couple new players on Flames of War. 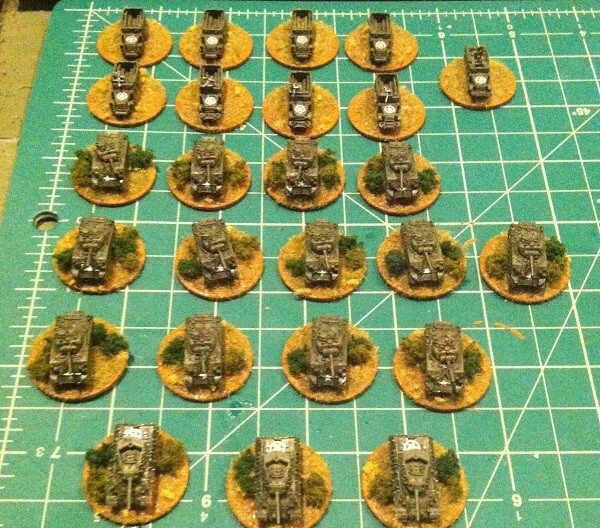 For that, we’ll all be thankful as we deploy our platoons for another game very soon.